After visiting Nakseonjae we headed back out towards the entrance of Changdeokgung. 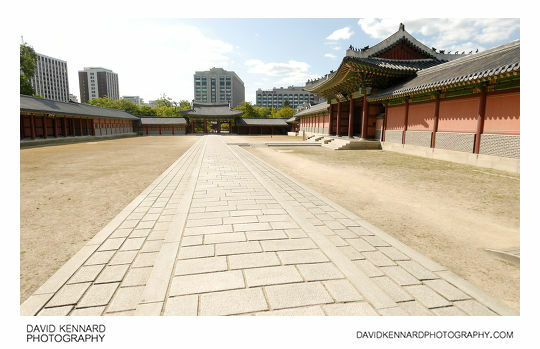 I took this photo looking west across the outer courtyard of Injeongjeon on the way there. 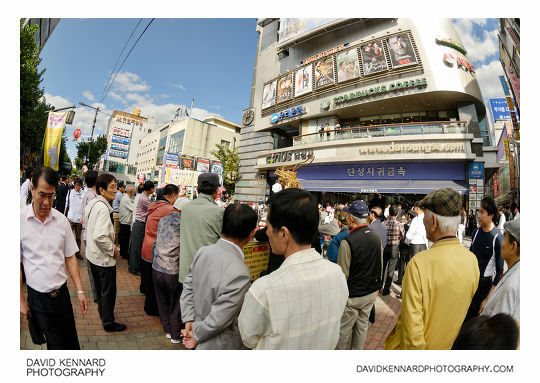 Going back down Donhwamun-ro, we passed Dansungsa cinema again, but they were now holding an event outside the cinema. Unfortunately we couldn't stay and see what it was, but I took a quick snap of the crowd gathered there. After collecting our belongings from the hotel we went to get the train to Incheon International Airport, but found that we didn't have enough cash to get to the airport. Unfortunately the Seoul Metro ticket machines only take cash, and they don't have ticket offices at the stations either. And we didn't have enough time to try and find somewhere with a cash machine. Thankfully there was a friendly Korean gentleman there who suggested getting the train to Gimpo International airport (which we could afford to get to - Incheon is the next stop after Gimpo but the price increases a lot to get to Incheon), and then getting some more Korean Won there. So we did that, and exchanged some £ for some ₩ at Gimpo. Though after having done this I noticed a ticket machine near Gimpo station that did take credit cards, which would have saved some time. Then with the cash we caught the next train from Gimpo to Incheon station. We had a quite a rush to get to Incheon airport and catch our plane in time, but I managed to get one quick photo at the airport. 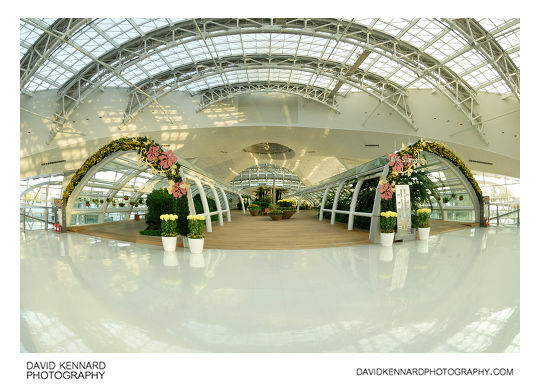 This is the IIAC Stargarden. We didn't have time to look round it, but apparently it is quite a nice place to come and relax. After checking in and going through security, etc. we did manage to catch the plane, and went off to Japan for two weeks holiday there.